Snorkeling is a fun beach activity for all the family. Basically snorkeling is swimming in the water wearing flippers or fins, a glass dive mask, and breathing through a tube called a snorkel that allows you to look down into the water whilte breathing through the tube. Anyone can snorkel. Young or old. Snorkeling is easy to learn and you don’t need a certificate of any kind. You only need to be able to swim to a degree that makes you feel comfortable in the water. 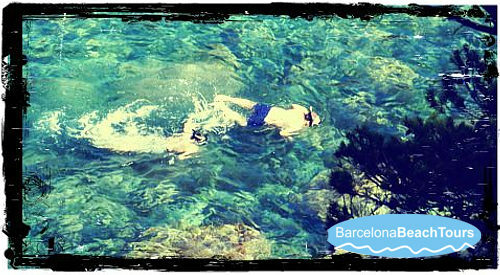 You do not have to be a champion swimmer because the fins and mask will give you some extra flotation. .
Where to snorkel in Barcelona? You can snorkel anywhere, but snorkelling is most fun if the waters are clear and there is something to see. In Barcelona the Costa Brava beaches are the best beaches for fun snorkelling. They have clear and warm water in the summer which are great from snorkelling from the beach. You will not see as many colourful and exotic fish as in other parts of the world, but it’s still a fun activity for kids and adults alike and you can be sure of seeing some local fish and fauna. 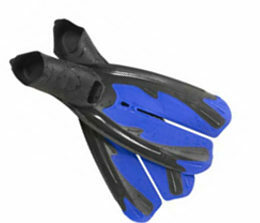 On a Barcelona beach tour with snorkelling you will loan a snorkel set that consists of snorkeling fins, a dive mask, and decent snorkel which is the breathing tube. The only thing you need to be able to do is be a reasonable swimmer. Almost anyone can quickly learn to use a snorkel with a quick lesson, but if you feel uncomfortable breathing through the snorkel then don’t worry because you can just wear the dive mask and hold your breath as you look down into the water. 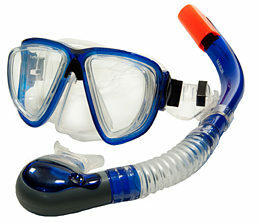 The snorkel mask covers you eyes and nose and allows you to see clearly underwater. The mask should be a good fit so that water does not leak in. When you are putting on the mask be sure to keep loose hair away from the seal of the mask. The mask strap should not be too tight and should be at the middle of the back of your head..
Fins help you swim like a fish. Snorkeling fins give swimmers extra propulsion much in the way fish use their tail to swim fast. Wearing fins lets you keep your arms at your sides so that you just use your legs to propel your forward and this keeps the water in front of you clear and calm. When putting on your fins be sure to check that the fins are a good fit. If they are too tight you might restrict blood circulation to your feet which can feel uncomfortable. If they are too loose, the fins might fall off. Usually if the fins are the right size and a good fit they should be tight but not painful and you should be able to move your toes. 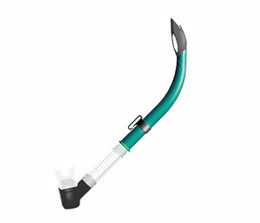 The snorkel has a purge valve at the bottom of the tube that stops water getting into your mouth when you dive underwater, but the tube itself will fill with water, so when you surface from a dive you must blow a quick hard breath into the snorket to force the water out of the one-way valve and also out the top of the tube. Your guide will show you how to do this. The snorkel be rinsed in fresh, clean water after each use. Our guides will disinfect all the equipment after each session. You can wear contact lenses for snorkling, but be careful not to have you eyes open if the mask does flood because you might lose them.